Millions of people across the globe live along coastlines in areas such as Florida, California, Thailand, Japan, and India. There are also millions of people who visit ocean resorts every year. The ocean side can be one of life's greatest beauties. But on rare occasions, it can quickly become one of the deadliest. Tsunamis are a result of rapid change in the ocean floor as a result of an earthquakes or volcanic eruption. On December 26, 2004, the tsunami in the Indian Ocean claimed over 150,000 lives and physically devastated the area. Tsunamis claim more lives than hurricanes, tornadoes, earthquakes and flash floods combined, making them one of the deadliest forces of nature. They give very little warning and we are just beginning to develop the technology to detect them prior to their arrival. If you plan on going to the beach, it's important to know the warning signs of an incoming tsunami, and what you should do to prevent personal injury. Find out from local agencies or your local resort if the hotel, apartment or resort you’re staying in is in a danger zone. You should determine a plan of action in the event of a tsunami, and have a plan A and a plan B. Chaos may be the norm prior to the impact, so flexibility is the key. Forewarned is forearmed, and good planning may mean the difference between life and death. Become familiar with the normal signs of an incoming tsunami, such as a feeling of rumbling beneath your feet, a rapid change in wave size, or water receding far away from the beach area. There has been documentation of people who will go out to the beach and watch in awe as the water disappears from the beach. Some find this fascinating, so they go out even further thinking it’s some strange anomaly. Just as quickly as the water recedes, it quickly returns with awesome power. 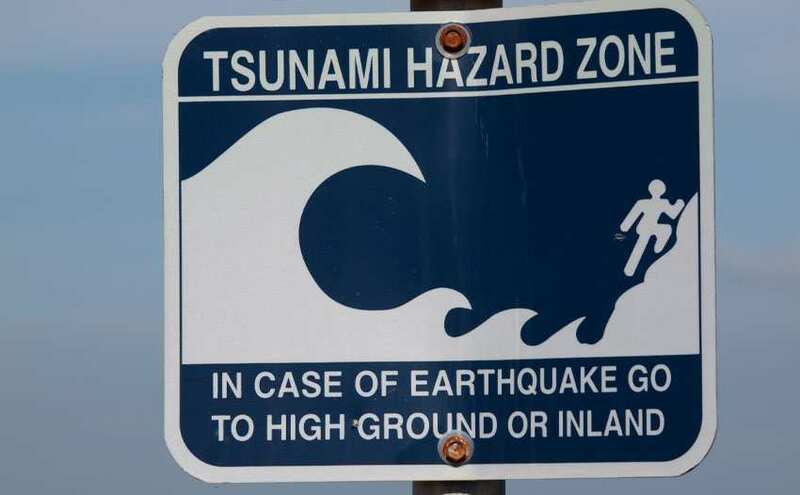 Never wait for a tsunami warning to be issued before you start protecting yourself and your family. Grab your supplies and head for higher ground immediately. Never try to outrun a tsunami. The water flows faster than any human can run. This includes trying to out run it in your car. Traffic nearby will likely be at a standstill, and once the flood waters arrive, your car becomes a death trap. If you’re a swimmer, don't think your skill will save your life. The amount of force will easily overcome any swimmer, and objects such as cars, buildings and other debris are likely to make survival in the water impossible. Once the water arrives, it will likely then change direction and flow back into the ocean, taking everything in its path with it. After reaching safety, stay where you are until the entire episode has subsided. Tsunamis can vary in size, being anywhere from 30 to 100 feet in height. They can move inland several thousand feet. It's vital that you quickly move to the highest level possible. Multi-story concrete enforced hotels are a good choice. Tsunamis can also come in several waves. Don't assume that after the first massive wave that the disaster is over. Often times, several more waves will come shortly thereafter, and these aftermath waves can be just as destructive. What happens if you find yourself on a boat when a tsunami warning is issued? It largely depends on your location. If you’re at port and in a small boat, you need to abandon it and find higher ground immediately. If you’re already out to sea, it might be better for you to quickly navigate your boat to deeper waters. The waves of tsunami’s gain height as they enter shallow waters. If you’re in a boat in deep water, you may not even realize one has just passed under you. Remember, tsunamis are extremely rare, so don't let this ruin your vacation at the beach, but do know the warning signs and take them seriously. No one can predict a tsunami well in advance. But if you are visiting an area which has a higher occurrence of earthquakes, it would be well advised to formulate a family plan in the off chance one becomes a threat.